The McNulty committee has produced a 350 page report on whether Britain's railways give value for money and how things might be improved. Proposed changes to fares have naturally received the most attention and comment, but there is an important chapter on rolling stock. The report refers to the lack of standardisation in rolling stock, with the result that some types of train are route-specific and cannot easily be redeployed. 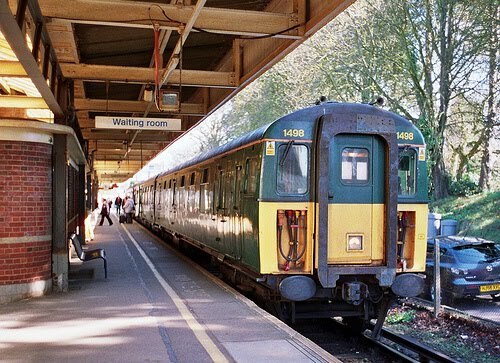 This is noticeable south of London, where each of the three train operating companies now has a fleet which is incompatible with those used by the others. South Eastern and Southern both run Bombardier Electrostars but they have different couplings. South West Trains run Siemens and Alstom fleets which are mutually incompatible, as well as being incompatible with the Bombardier units. And all three train operating companies have trains inherited from British Rail which are incompatible with all the post-privatisation fleets. This incompatibility should never have been allowed to develop but it seems that the rail franchising authorities were asleep when the critical decisions were being made. It is in striking contrast to the situation on the same routes in the 1960s, when most of the fleet was standardised to the extent that all the EP types (such as the CIG class above) - everything built between about 1954 and 1974 - were operationally compatible. A train could be composed of stock belonging to any of the different EP classes. In addition, to provide even more flexibility, the class 33 diesel locomotives, the class 73 electro-diesel locomotives, and the REP high powered units could be used with any of the electric EP units, including the TC trailer sets which were specifically designed for push-pull operation. This is over particular relevance to McNulty's analysis. It seems to have missed the connection between fares and rolling stock design. Recent decades have seen the near-universal replacement of locomotive-hauled stock with unit trains such as Voyagers and Pendolinos. Of fixed length, extra vehicles cannot be added to cater for extra traffic at peak periods. This must be a major reason for the complicated structure of fares which are meant to tailor a variable demand to a fixed supply in an attempt to get round the lack of flexibility. Until about 1970, the railways had traditionally kept a pool of older vehicles in reserve, which would be brought out at peak periods, but modern methods of railway operation, and modern types of rolling stock rule out this option. It is a pity that McNulty failed to notice this. There was a discussion about the Japanese model for trains. They said that the train station is commercialized to the extreme, with many shops and services for the people who are waiting for the train. And that the income from these is what pays the majority of costs. Erik - thanks for this. This is an example of the general principle that railways create footfall, thereby enhancing the value of location. The land value that railways sustain is largely out of reach of those who construct and operate the systems but there are ways by which it could be captured, for instance through a system of land value taxation or land-rent charge. How's this for residual value?